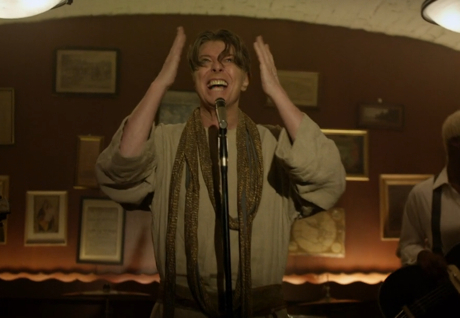 Yesterday (May 8), David Bowie unveiled a wacky, blood-spurting video for new single "The Next Day" that found him posing as a Christ-like figure in a seedy club and Gary Oldman acting as a punchy priest. Apparently, religious group the Catholic League is not amused, as the organization's president Bill Donohue has lashed out at Bowie, calling the singer "confused about religion." A statement released on the Catholic League's website described Bowie as a "switch-hitting, bisexual, senior citizen from London," and calls the video "a mess" over its use of imagery, from the barfly cardinals and self-flagellation, to the unfortunate case of dancefloor stigmata that Marion Cotillard suffers late in the clip. He goes on to criticize an old Bowie quote about exploring philosophy and his spirituality before jumping into the arts — "Too bad the pottery didn't work," Donohue quips. Donohue also notes that Bowie's fascination with Catholicism, described by the league president as "the Cadillac of all religions," suggests all is not lost for the singer. "There is hope for him yet." Donohue had previously criticized Bowie over a 1997 advertisement in which the artist was "obviously posing as Christ." The president added at the time, "If this is supposed to be cute, it fails." Bowie has not commented on Donohue's latest critique. In other "The Next Day" controversy, the video, conceptualized by Bowie and directed by Floria Sigismondi, was briefly pulled off of YouTube for violating its terms of service. The clip was brought back shortly, though, with a YouTube spokesperson noting to Billboard of the error, "With the massive volume of videos on our site, sometimes we make the wrong call."